By Geert Lovink, March 25, 2019 at 12:18 pm . 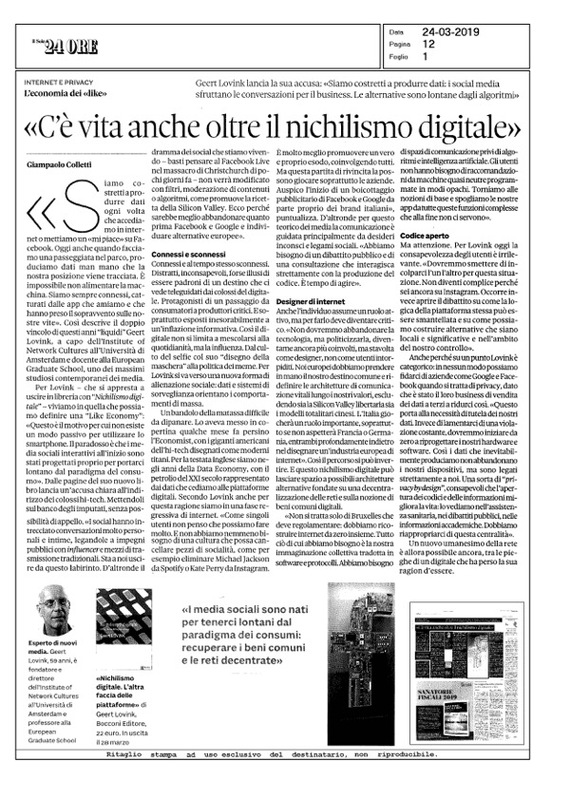 Giampaolo Colletti: What historical and social phase are we going through from a digital consumption point of view? How does the digital affect the everyday life? Geert Lovink: Remember that interactive ‘new’ media, as they were called until recently, were destined to take us away from the consumption paradigm. In this age of platform capitalism we are condemned compulsively contribute to a black box. The system is designed in such a way that has become impossible to merely take in. Imagine we could only download data and not give anything back. This would be paradise; the whole privacy and surveillance drama would not exist. The fact is, we are forced to give away data each time we swipe, click or like. This is why there is no passive way to use a smart phone. Even when we take a walk through the park, we produce data as our location is tracked. It is impossible not to feed the machine. For most of us there is no distinction anymore between telephone and society. We’re connected 24/7, captured by the apps we love and that have taken over our lives. GC: You said: “Let’s get away from the screens and start looking at each other again.” What do social media and mobile connections represent for our lives today? Which is the other side of the platform? GL: I am not a promotor of European offline romanticism. In my book Sad by Design I have criticized this position. We should not walk away from technology but politicize it, become even more involved, but this time as designers, not as numbed consumers. We, Europeans, need to take up our common destiny and redefine the vital communication architectures along our European values and distance ourselves from both libertarian Silicon Valley and Chinese totalitarian models. Italy can play an important part in this. Do not ait for France and Germany, as both countries, for different reasons, are deep asleep when it comes to building up a European internet industry. This is not about Brussels stepping in to regulate, no matter how tempting it is to hand out big fines. We need to build up European internet culture from scratch. Remember, this is not all that hard. These are virtual networks anyway. The infrastructure is there, the user base is there, all they need to do is to download the app. What is required is our collective imagination how we want to structure social life, and then translate this into software and protocols. GC: What role do individuals play? And companies? And the governments? GL: A Facebook and Google advertisement boycott by Italian companies would be a good start. As individual users I don’t think we can do much. What can happen is a general social media strike, that would be a very Italian gesture, no? I do not believe that we should start to police each other. The worst would be to medicalize the field: I can tell you, Giampaolo, you are not sick, you are not an addict and we will not send you to a digital detox clinic. We do not need a ‘cancel culture’ either, where one day we delete Michael Jackson from Spotify and the next day Kate Perry from Instagram. Let’s stop with such ‘social media backlash’ gestures. It is much better to unleash a real and final exodus, together. But please spare us the moralism and pedagogy. We need to forget this regressive phase of the internet as soon as possible. Communication is mainly driven by (unconscious) desires, community and social bonds. For financial profit reasons, Silicon Valley has decided to mix very personal, intimate conversations with public engagements with influencers and traditional broadcast media. It is up to us to entangle their mess. The social media drama that we are experiencing now (look at the use of Facebook Live in the Christchurch massacre) will not be changed with filters, content moderation, algorithms or ‘behaviour modifications’, as Silicon Valley promotes. It would be good to leave Facebook and Google but first we need to have European alternatives. As you can imagine, this can easily become a chicken-egg dilemma because how long should we still wait for these public services? Do we need a five year plan? I doubt, we’re not Chinese… We should not only express our good intentions: enough EU policy papers and research! Really, we have done enough research, remember, these topics have been with us for the past 30 years. That’s a long time. We need public debate and consultation that closely interacts with the production of code. It is time to act. Communication is closely tied to the fate of democracy and our civil freedoms. We should not delegate those to either governments or corporations and take matters in our own hands. This should be subscription-based and not depend on either government subsidies (and control), nor on advertisement. GC: A few months ago, the hi-tech giants were represented on the Economist cover as modern titans. But in these years of Data Economy do you see an improvement of the users’ awareness? How do you see the scenario about privacy issues? GL: Awareness of users is irrelevant. We should stop blaming each other for this mess. You are not complicit because you’re still on Instagram. Let’s instead open the debate how the platform logic itself can be dismantled and how we can build alternatives that are local and meaningful and within the realm of our control. There is no way we can trust companies like Google and Facebook when it comes to privacy as it has been their core business to sell our data to third parties (including NSA and other secret services) behind our backs. This leads to the question of ‘data prevention’. Instead of complaining, time and again, about a ‘breach of trust’ we should should start from scratch and re-design our hardware and software so that the data that we, inevitably, produce, do not leave our devices. We could call this ‘privacy by design’ but I hesitate to use this term as I do not believe that the legal term ‘privacy’ is a good starting point when we have to design communication networks. Let’s not give our lives in the hands of lawyers. In certain situations we all benefit from openness, for instance when it comes to public debates, information of universities, public transport, health care, that we all need to be able to consult. GC: Have you talked about the Like Economy in the past? Today, what kind of economy did it come from? How do you imagine our navigations in the future, the social media of tomorrow? GL: The rise of the ‘like economy’ is linked to the sudden growth of Facebook. I remember that on our circles of critical internet scholars we started to get a ridumentary understanding how innocent gestures such as a ‘like’ is turned into money, back in 2013. For me a turning point was the PBS Generation Like documentary, produced by ‘Team Human’ Douglas Rushkoff, back in early 2014. It is still worth seeing. This is what we now call the ‘attention economy’. As soon as we will drop the link between advertisement and internet content we will be able to render this knowledge irrelevant. We need communication spaces that are free of algorithms and artificial inteliigence. Users do not need recommendations of quasi-neutral machines that are programmed in opaque ways. Let’s go back to the basics and strip our apps from all these so-called complex features that, in the end, do not serve us. Imagine a tourism industry that is post-recommendation! Wouldn’t that be an exciting Italian venture to further develop? Imagine search without personification, this is an almost subversive proposition. How do you want information to be listed? GC: What are the alternatives for a conscious use of digital? Which are platforms and projects that can be considered as an “exit strategy”? GL: We can switch to the Duckduckgo search engine and no longer use the Google search engine,nuse Mastedon instead of Twitter, install Signal or Telegram and delete Whatsapp. No Google Maps but OpenStreet Maps. Forget Safari and Chrome, use Firefox, no Skype, instead use Jitsi. These are all short-term steps everyone can do, on the spot. Most of all need to re-introduce decentralized services and build up a public infrastructure that is resilient against data capture: is should be safe yet open. This is easier said than done. The legacy of Edward Snowdon is an ambivant, unfortunate one. This is not his mistake. The deeper we dig into surveillance capabilities, the easier it is to get depressed. We need to get rid of the paranoid mindset as it undermines our very ability to think in a critical way. The paranoid mind is a cancerous form of hyper-enlightment that destroys our very ability to act. As a result we become cynical, tired and indifferent to the world. The best exit strategy is to come together and build ‘networks with consequences’, organized networks, as we call them, based on strong ties, coming together in social networks where we are not being destracted by updates and (fake) news, where we focus on each other and getting things done.